A Brief History: OVPR was started in 2004 by Tim and Tiffany Stewart. They both grew up having various experiences with the paranormal. After many conversations about what they each had witnessed throughout the years, they decided to form their own research group. Please take your time to visit us at www.ohiovalleyparanormalresearchers.com and look around. If you have any questions, concerns, or comments, send us an email. We're always happy to hear from people. Statement: The OVPR utilizes a scientific approach to investigating the paranormal; balancing healthy skepticism with having an open mind. We do not believe that any form of spiritualism, black or white magic, etc., is necessary to observe, study and document paranormal activity and events. 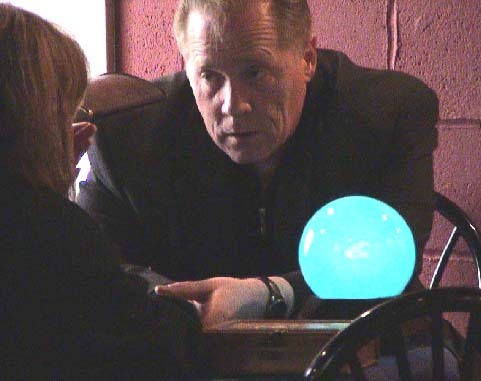 The Ohio Valley Paranormal Researchers do not claim to be an authority or an expert on anything paranormal, as we acknowledge that there can be no such thing in the field of paranormal investigation. Having said that, please let us explain what we mean-- In this field, we gain knowledge and experience because a being in the spirit world (be them once human or not) allows us to be witness to their manifestation. We cannot control the manifestations, we can simply be lucky enough to have good timing and be in the right place at the right time. What evidence we get, visual or audible, is given to us. Taking in to account the fact that people lie, what is to stop a spirit from lying? What rule is there that says they *have* to show us thier true selves or speak only the truth to us? There isn't one. Therefore, evidence like EVPs, is gathered on the assumption that what is being told to us is a fact. We can gather evidence that there is, in deed, something paranormal hanging around a residence, but we cannot get any garuntee on who or what is giving us that evidence. Knowing that, we have our belief that one can't be an expert on anything paranormal. You can be experienced, learned, well-knowledged about the latest techniques and equipment, but you cannot be an expert on the being itself. The goal of the OVPR is to give you information and evidence of the paranormal so that you may come to a well-informed decision about spirits. The information we post on this site, as well as pictures, video or film footage and EVPs, will be completely truthful and well-researched. We will never purposefully give out misinformation. We believe in balancing skepticism with belief- we believe in the paranormal, yet we are skeptical of evidence until we have exhausted all other possibilities. This, we believe, will give our findings maximum credibility. Any websites we list, we believe to be very credible as well. If you find that you are having problems with something you believe to be paranormal, do not hesitate to contact us. We'll be happy to speak with you and help you if at all possible. If, for some reason, we cannot help you we will try to direct you to someone who can. It is important to note that OVPR does not charge for any home investigations that we conduct, though any donations for tapes, gas, batteries, etc..will always be appreciated. Don't be tight help the fight! Hurricane relief Donate a dollar your contributions are very welcomed! A real ghost can haunt you and you wouldn't know it until someone Paravoyant points it out to you.